Sportsman’s Park seated about 34,400, but paid attendance was a record 45,715.4 The overflow crowd ringed the outfield, shrinking the playing area and turning routine fly balls into ground-rule doubles. Under what The Sporting News called “unspeakable” playing conditions,5 the teams combined for 23 doubles in the second game to set a major-league record after collecting nine in the opener.6 The Cardinals’ 13 doubles in the nightcap were the most by a team in the modern era,7 and one of them possibly played a role in deciding the National League batting title. With the threat of rain in the air, Cardinals owner Sam Breadon led policemen, ushers, umpires, and players in clearing the field so that the first game could begin. Eventually, the spectators took up posts around the outfield about 70 feet beyond first base, 150 feet past second, and 100 feet from third. But they rushed toward baseballs hit in their direction, fighting among themselves and even pushing aside players to get souvenirs. Under the threat of forfeit, the fans later moved back toward the fences, but even so, “a solid outfield fly was sure to fall among the customers for a double.”12 The Cubs rallied for five runs in the seventh inning of the opener to defeat the Cardinals, 7-5. The scoring started early.16 Chicago got two runs in the first inning against veteran right-hander Flint Rhem, who had lost to the Cubs in his previous start, on July 7. Footsie Blair led off with a pop fly to shallow center field that went for a double when Pepper Martin slipped and fell. Woody English reached on an error, and Kiki Cuyler drew a walk. 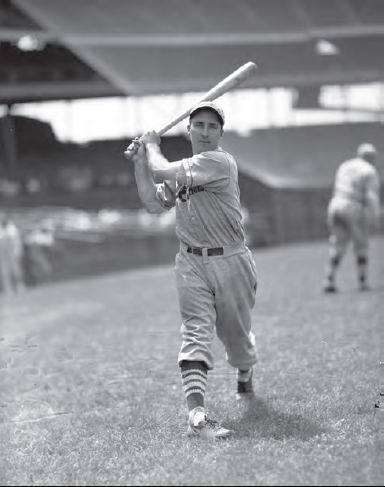 After Hack Wilson struck out, Blair and English scored when shortstop Sparky Adams, the Cardinals’ regular third baseman who was substituting for the injured Charley Gelbert,17 fumbled Rogers Hornsby’s groundball and then threw high to first. Cuyler, who had moved to third, attempted to score when Danny Taylor flied to center, but Martin threw him out to end the inning. St. Louis immediately answered with three runs against Pat Malone, a hard-throwing right-hander who had beaten the Cardinals twice in the past week — a 10-inning complete game on July 5 and a two-inning relief stint two days later. Ripper Collins doubled into the overflow crowd to drive in George Watkins with the first Redbird run. Chick Hafey brought home Collins with another double into the crowd, and Martin singled in Hafey. The Cardinals held that 3-2 edge until the top of the fourth, when the Cubs scored four runs. After Charlie Grimm and Gabby Hartnett reached on consecutive singles, Rhem cleanly fielded Malone’s bunt but threw wildly to first. Grimm scored, Hartnett went to third, and Malone wound up at second. Blair cleared the bases with a three-run homer onto the pavilion roof in right field. Chicago’s lead did not last long, however, as St. Louis erupted for seven runs in the bottom of the inning. Gus Mancuso and Ernie Orsatti, batting for Rhem, both doubled into the crowd to start the rally. Adams then singled to center, with Orsatti scoring on Taylor’s error. Malone struck out Watkins, but Frankie Frisch doubled, advancing Adams to third and prompting Hornsby to bring in Guy Bush. The wiry right-hander walked Hafey to load the bases, and Martin followed with a single to drive in two runs. Andy High’s double scored Hafey, and Mancuso drove in Martin and High with his second double of the inning, a short fly ball that fell untouched after shortstop English and left fielder Wilson got their signals crossed. But the Cubs tied the game in the top of the fifth with four runs against reliever Allyn Stout, a rookie right-hander who faced four batters without recording an out. After Taylor walked and Grimm reached on Adams’ third error of the game, consecutive doubles by Harnett and pinch-hitter Les Bell, batting for Bush, produced three runs. The fourth came after manager Gabby Street replaced Stout with another rookie right-hander, Paul Derringer. After Blair struck out, English doubled to drive in Bell, the run charged to Stout. At the halfway point the score was knotted, 10-10. From that point the Redbirds took control. They added three runs in the fifth on doubles by Frisch and Collins off Charlie Root following Ed Baecht’s walks to Adams and Watkins; two in the sixth against Sheriff Blake on a walk to Adams, a wild pitch, a double by Watkins, and singles by Frisch and Collins; and two off Blake in the eighth on a walk to Frisch and doubles by Collins and Hafey. The Cubs managed a run in the sixth on Derringer’s wild pitch and scored twice in the ninth on doubles by Blair and English when fans in the outfield grabbed the ball. Derringer picked up the win, allowing three runs on seven hits in five innings. Baecht, who pitched to only two batters in the fifth inning and walked both, took the loss. Derringer and Malone each surrendered five doubles, Blake allowed four, and Rhem gave up three. Four hitters had three doubles each (Collins, English, Hartnett, and Mancuso), while three had two apiece (Blair, Frisch, and Hafey). Ironically, Sparky Adams, who led the league with 46 doubles that season, managed only a single in four at-bats after going 0-for-1 as a pinch-hitter in the first game. The outcome of the doubleheader had no impact on the pennant race; St. Louis finished with a 101-53 record, 13 games in front of the runner-up New York Giants and 17 ahead of the third-place Cubs. But the second game may well have affected the batting title, which Hafey won by a fraction over teammate Jim Bottomley and Giants first baseman Bill Terry. Hafey started the first game and was 0-for-1 before being replaced by Orsatti. He had two doubles in the second game, however, and at least one of them — his two-bagger in the first inning — went into the overflow crowd. Bottomley played only in the first game and had one hit, a single. Assuming that the ball Hafey hit into outfield crowd would have been caught, he would not have won the batting crown. Hafey finished the season with 157 hits in 450 at-bats for a .348889 average. Terry was second at .348609 and Bottomley third at .348168.21 Take away that ground-rule double, and Hafey would have finished with 156 hits, dropping his average to .346667. 1 J. Roy Stockton, “45,715 Pay to See Cardinals and Cubs Burlesque Double Bill,” St. Louis Post-Dispatch, July 13, 1931: 1B. 2 “Rhem and Hallahan to Pitch Today,” St. Louis Post-Dispatch, July 12, 1931: 1E; “Cards’ Box Office Will Remain Open Nights This Week,” St. Louis Star, July 10, 1931: sec. 2, 1. 3 Irving Vaughan, “Cubs Rout Cardinals Twice Before 45,000,” Chicago Tribune, July 8, 1931: 25. 4 “Crowd Statistics,” St. Louis Post-Dispatch, July 13, 1931: 1B. In response to a query eight years later, the Cardinals reported the paid attendance as 45,770. See J. Roy Stockton, “Extra Innings,” St. Louis Post-Dispatch, August 11, 1939: 2B. The previous record was 39,600 during the 1930 World Series. For a regular-season game, 38,296 had paid to watch the Cardinals play the Giants on May 20, 1928. See “St. Louis Fans Surge on Field to Set Record,” The Sporting News, July 16, 1931: 2. 6 Baseball Almanac, https://baseball-almanac.com/rb_2b2.shtml. See also “Record for Doubles,” Chicago Tribune, July 13, 1931: 22; “Cards, Cubs Divide; Crowd Sets Record,” New York Times, July 13, 1931: 20; “23 Doubles in One Game Breaks Mark Made in ’83,” The Sporting News, July 16, 1931: 5. The 32 doubles in the doubleheader were also a record. Baseball Almanac, https://baseball-almanac.com/rb_2b2.shtml. 7 The Chicago White Stockings had 14 doubles against the Buffalo Bisons on July 3, 1883. Baseball Almanac, https://baseball-almanac.com/rb_2b2.shtml. 12 Irving Vaughan, “Cubs Lose to Cards, 17-13, after Winning, 7-5," Chicago Tribune, July 13, 1931: 21. 15 “Fans Pay $46,629 to See Cards and Cubs in Twin Bill,” St. Louis Star, July 13, 1931: Sec. 2, 2. 16 The play-by-play in this account is based on Retrosheet.org and Vaughan, “Cubs Lose to Cards, 17-13, after Winning, 7-5.” However, neither source is complete regarding the ground-rule doubles into the crowd. 17 Gelbert had a bruised heel, while Adams was in the lineup despite a pulled leg muscle. Utility infielder Jake Flowers, who had been badly spiked at Wrigley Field earlier in the week, managed to play the first game at shortstop but was forced to sit out the second because his wound had opened. “Cards Carry on With Patched Lineup; Play to Record Crowd,” The Sporting News, July 16, 1931: 1. 21 David L. Fleitz, Silver Bats and Automobiles: The Hotly Competitive, Sometimes Ignoble Pursuit of the Major League Batting Championship (Jefferson, North Carolina: McFarland & Co., 2011), 94.